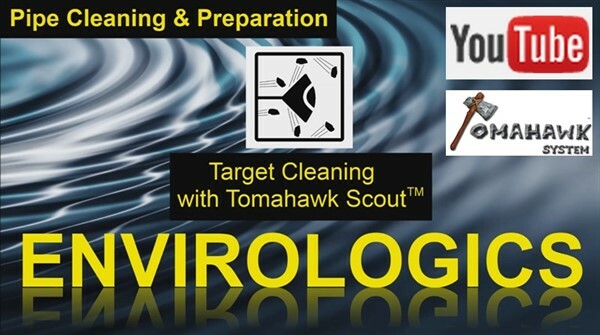 The innovative and patented Tomahawk Scout™ is an integral member of the Tomahawk™ System and is tasked with the concurrent preparation and inspection of the pipe interior following airborne abrasive cleaning. The airstream driven Scout does its job fast and efficiently utilizing CCTV capability to spot areas that require targeted cleaning and drying while observing the action in real time. 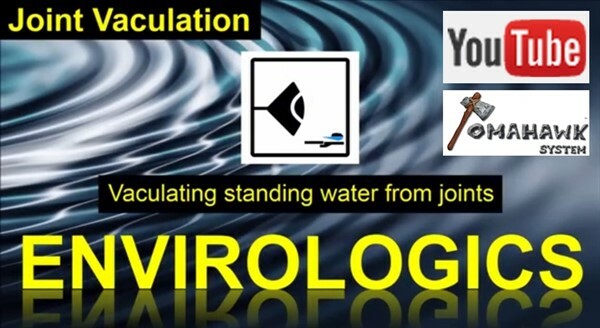 The vaculating or drawing out effect produced by Scout can also aid in the discovery of trouble spots such as holes or cracks for immediate remediation. This is one versatile device! The picture below shows a pipe as inspected by the Scout after pipeline cleaning. The wall of the pipe has been cleaned to a NACE No. 4 compliant surface. Visible white pockets in the pipe wall indicate where graphitic corrosion has been removed. The service connection seen was target cleaned using the Scout to a NACE No. 3 compliant surface for superior liner bond at this crucial location. This meets the requirements for pipe preparation for ASTM F3182-16 "Standard Practice for the Application of Spray-Applied Polymeric Liners Inside Pipelines for Potable Water". Click on the video below to watch Scout target clean the service connection shown in the picture above while the airstream is being flooded with abrasives. 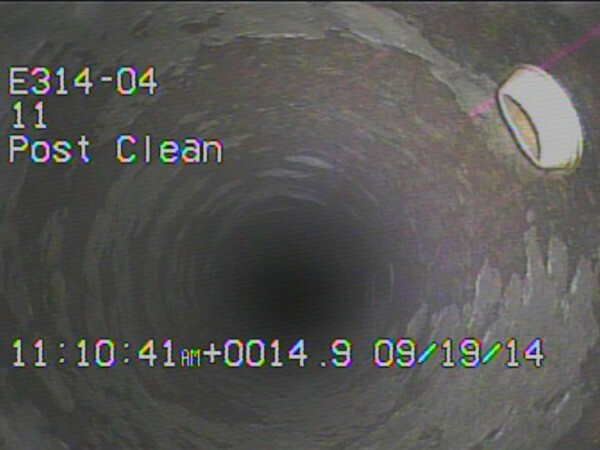 The picture below shows a pipe after cleaning, during pipe preparation and inspection. Scout is vaculating a joint of loose debris and standing water and quickly dries the pipe, preparing the joint and pipe for liner application. Click on the video below to watch Scout vaculate the pipeline joint shown above in real time. 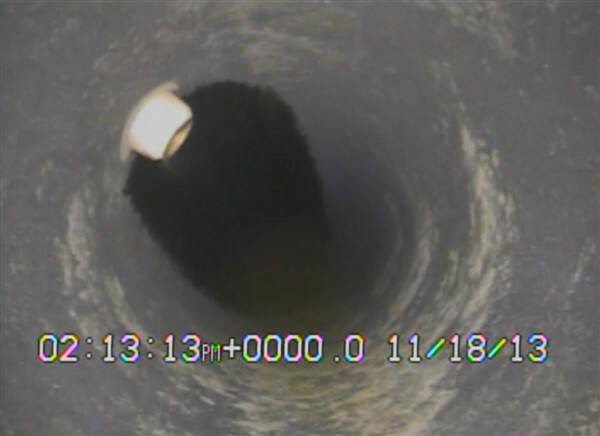 The picture below shows Scout vaculating or drawing out standing water from a service connection during concurrent preparation and inspection of the pipe. The service connection is vaculated to help prevent water dripping from the service during the lining process helping to ensure a high quality liner application. The airstream quickly dries the pipe wall following vacualtion. The Scout can then quickly move to the next joint or service connection for further preperation and inspection. 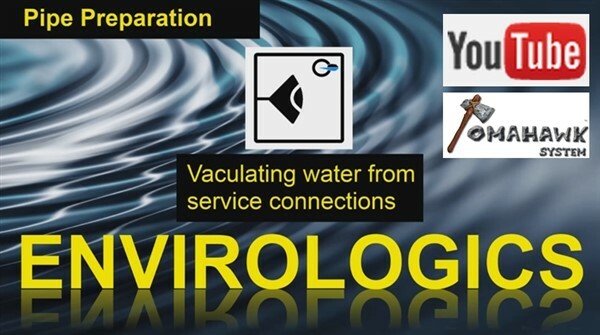 Click on the video below to watch Scout vaculate and dry the service connection shown above in real time. 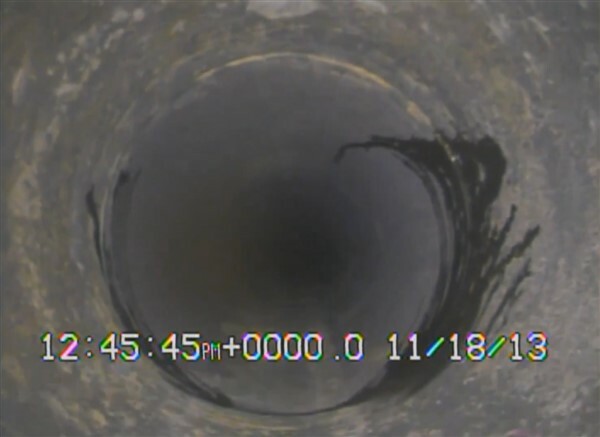 Scout helps to ensure the bond results you need for long-term, leak-free liner performance in those hard to clean areas such as joints, crevices and service connections. Check back with us soon to keep up-to-date with the latest Tomahawk Scout™ developments.